Almost forty years ago, storied ad man David Ogilvy sat down in an office somewhere in India and recorded a little film confessing the — as he put it — “secret weapon” of advertising that actually works. It was a hot day, so he took off his jacket, exposing his infamous red suspenders. 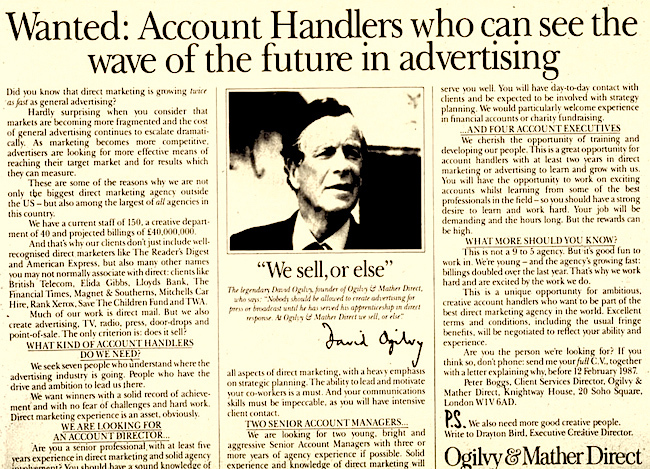 Ogilvy spoke simply and directly to his audience on the other side of the camera. The prophecy he uttered in that grainy 7-minute film all those years ago has come to pass, with a bullet. Though visionary, Ogilvy could not have imagined just how powerful his “secret weapon” would become in the age of the Internet, or how it would ultimately be wielded by individuals building media companies with nothing more than a laptop and sufficient quantities of research and sweat. Watch the grand old man below. Make the connection between Ogilvy’s 80-year-old secret and the principles we talk about around here week in and week out.